this week i am in sunny* craig, colorado and steamboat springs. my french boyfriend got a call a few months ago from a lady who used to show some of his work in her gallery about three years ago. that gallery has since closed, but she is working with two new galleries in steamboat springs, and they wanted the boy to be their first guest artist for 2010.
his show will be up all month, with a reception on january first for the monthly artwalk they have. so, because we wanted to see some of his family for Christmas and because he had this show, we are spending the week here in craig and new years eve/day in steamboat springs. small town america. good times. 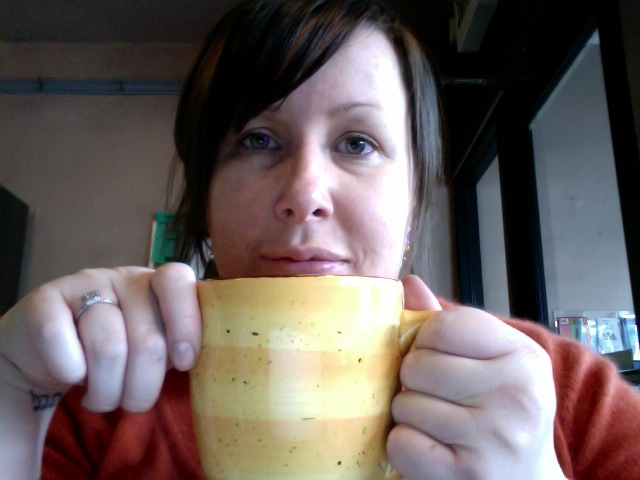 this morning i am typing this from a small coffee shop called serendipity, where i’ve just consumed about a half-gallon mug of tea (i seriously have not seen cups of tea this big EVER) and a freshly made cinnamon bun the size of my face. my sugar-coma should come later this morning. my brother tucker and his wife julie with their littles were spending Christmas up in Breckenridge with her family, and so we stopped and had a mini-beer at the dillon dam brewery with my brother, his father-in-law and brother-in-law on our way up. it worked out perfectly, as they happened to be at the restaurant at the exact time we were stopping through, and it’s right off the highway. i love it when things work out perfectly like that, or when you plan out your events so you have the perfect amount of time to do things. it’s an “exact change” kind of perfection that makes me very happy in my life that is otherwise definitely not like that. so here we sit and type, and to give you an idea of what it’s like to be in small town america, we have been here one day, and the boy has already gotten one comment on his “funny boots”. according to my small town translation book, funny = stylish and cool in the normal world. as we were sitting here, both with our mac laptops out (which, admittedly, is super yuppie, but we both had to get some work done this week and have no internet at his dad’s house where we are staying), this kid walks by and says “whoaaaaa, cool computers!”. that made me laugh. i have to go now, as the french boyfriend has nearly burned his esophagus with scalding coffee and now i have to type his pretentious artist’s statement for the gallery, while we attempt to make it not pretentious. – it’s a babypalooza out there right now! my friends sara and irene just had lovely lovely children over this christmas holiday and on christmas as well, so welcome and kisses to babies dawson and tessa; you have great moms and i can’t wait to meet you. i also have no less than three other friends who are welcoming their first babies in the new year. what fun! – happy anniversary to my mom & dad today! – to all my old friends i got to see over the last week; good old friends are one of the most valuable treasures in my life, and it’s like a christmas present to see them again. i must get to ironing out my master plan to get all of us to live in one place. – to my french boyfriend, who makes the holidays very happy and warm for me, and who also looks awfully cute in winter cardigans, boots and scarves. here’s to ending a very exciting and crazy year, and looking forward to a new decade. AH! 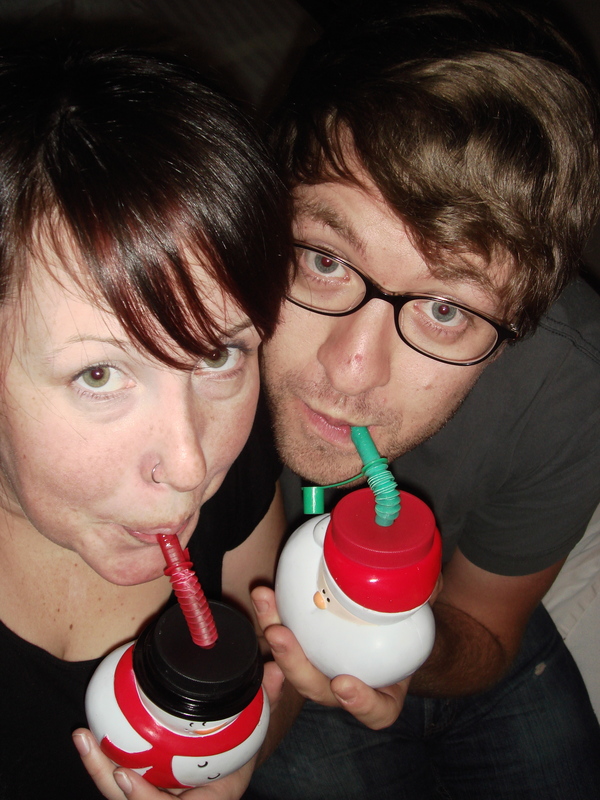 There had better be an alcoholic beverage in those festive sippy cups.